The Enlightenment may claim many successes because of science and technology, but it failed economics. 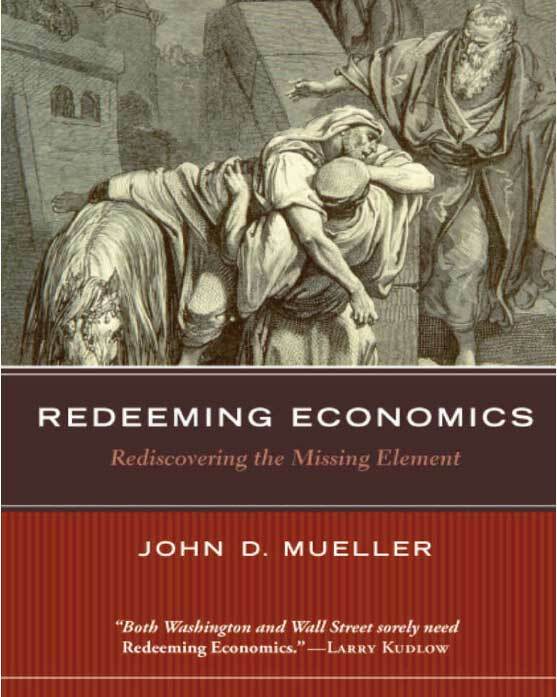 John D. Mueller argues in his 2010 book Redeeming Economics: Rediscovering the Missing Element, that modern Enlightenment views of economics suffer from the omission of factors that had previous been considered central to a complete understanding of human economics. Basically, there are four activities key to classical human economics, as developed by Thomas Aquinas, following Aristotle and Augustine: Humans produce, exchange, distribute, and consume goods. Adam Smith, considered the father of modern economics, says Mueller, simplified this scheme, eliminating two of the four elements, distribution and consumption. Rather than focusing on marketplace supply and demand and price, which "produce" and "exchange" deal with, "economics is essentially a theory of providence. It mostly concerns human providence, describing how we provide for ourselves and other persons we love, using scarce means that have alternate uses." (3-4) Mueller proceeds to present economics in detail on three levels of operation: personal, domestic, and political, because, we are, as Aristotle put it, "rational, matrimonial, and political animals." (5) The matrimonial is the domestic level. When we include the matrimonial or domestic, the economic calculus changes, as spousal and parental sacrifice and love do not follow the contours of the marketplace of production and exchange. If we include the matrimonial / domestic aspects, we return to the root of the word economics: oikos-nomos, the law of the house, the domestic economy, which does not follow the same dynamics as the production and exchange of goods. Modern economic theory views the household as just another part of the larger national economy. It views the domestic home as merely a roof under which a certain number of individual consumers of various ages live. A spreadsheet comes in handy. The family is of a different order than other relationships—social, business and government—personal, economic, and political. Societies, like chemical compounds, may come in many varieties. You can have a tribal society, for example, or a communist, capitalist, socialist, fascist, totalitarian, imperial, colonial, feudal, theocratic, criminal, or democratic society. In each case, you would have to explain to an outsider how any given society works. Its nature cannot be assumed. But the family, founded on the marital union of the male and female and the lives that union is empowered to procreate, is universal. Families encountering each other from different cultures do not have to explain to each other what a family is. Mother, father, son, and daughter, are essential building blocks of humanity itself and all societies. Marriage and family are at the quantum level of all human life. Appropriately, man himself has been told to prepare for a great wedding feast by One who invites us to buy wine without money, without price. How's that for economics?